Animal tissues. Trabecular bone. Atlas of Plant and Animal Histology. 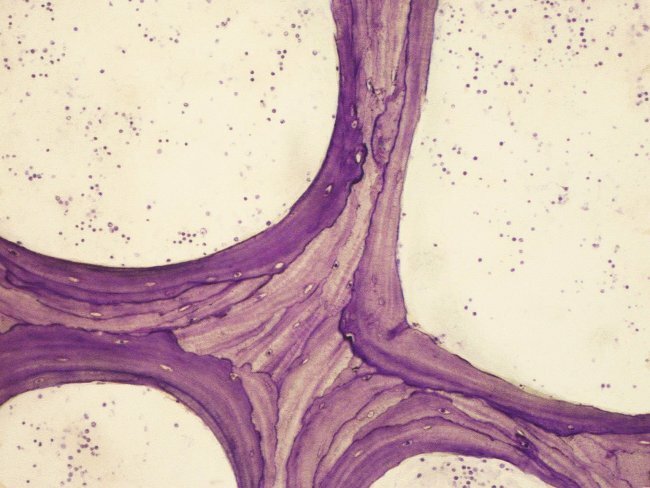 The image is from trabecular bone. Organ: spinal vertebra, trabecular bone. Species: sheep (Ovis aries; mammal). Technique: Stained with toluidine blue. D. Santiago Gómez Salvador (Dept. Anatomical Pathology, Faculty of Medicine, University of Cádiz. Spain) is the author of the picture. Tthis tissue consists of a three-dimensional network of bone trabeculae that form a system of large and irregular vascular cavities. These cavities contain blood vessels and bone marrow cells within loose connective tissue. 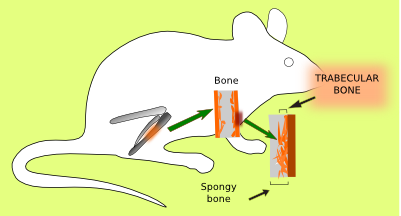 Trabeculae are composed of bone plates of variable thickness (3-7 µm), which are distinct layers of extracellular matrix formed by parallel collagen fibers, and regularly distributed osteocytes.